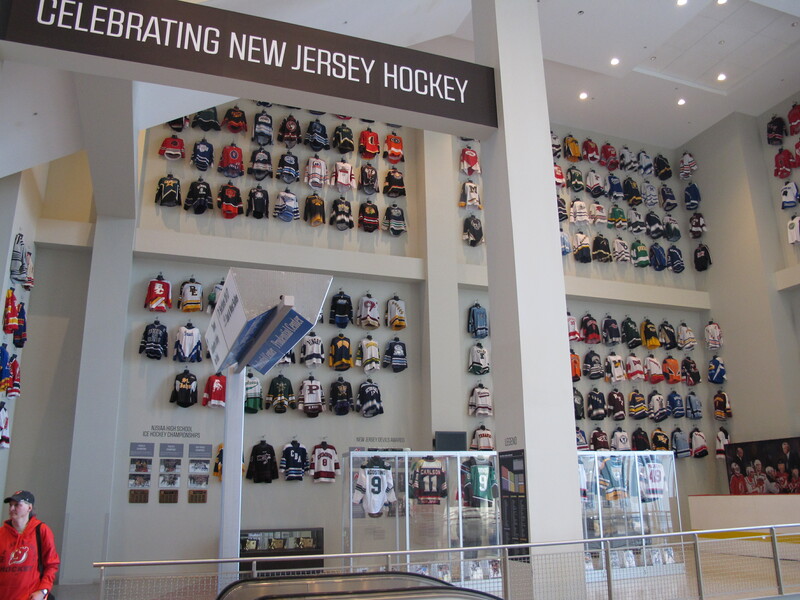 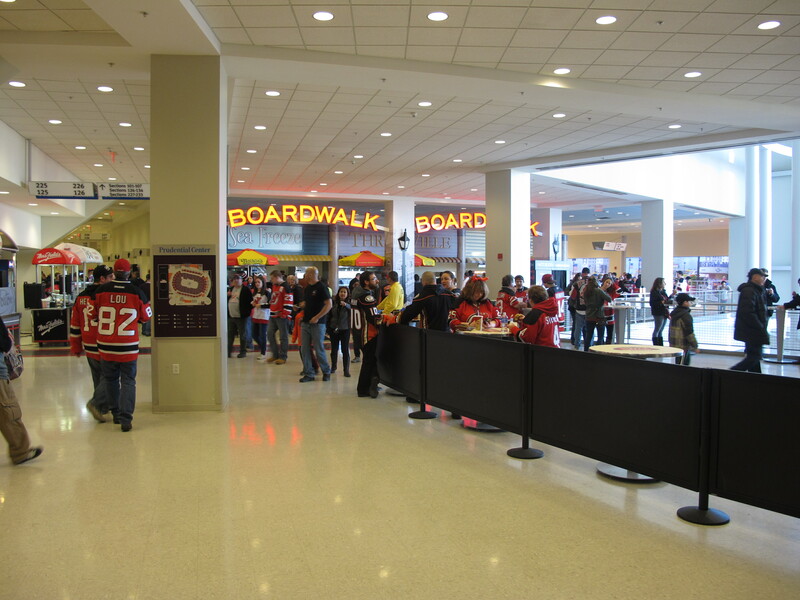 From the moment you enter the building, and to all points traveled, it just feels great to be in this building. 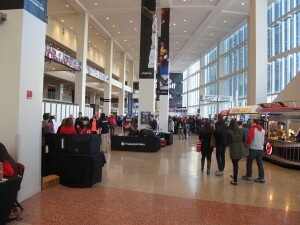 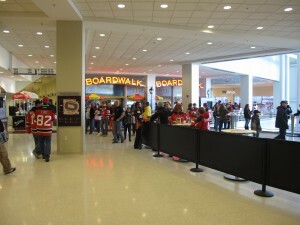 The concourse levels are extremely roomy, and most with natural light coming in to the building. 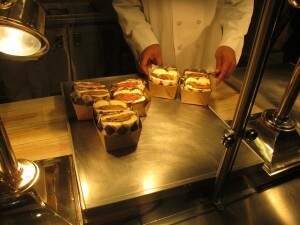 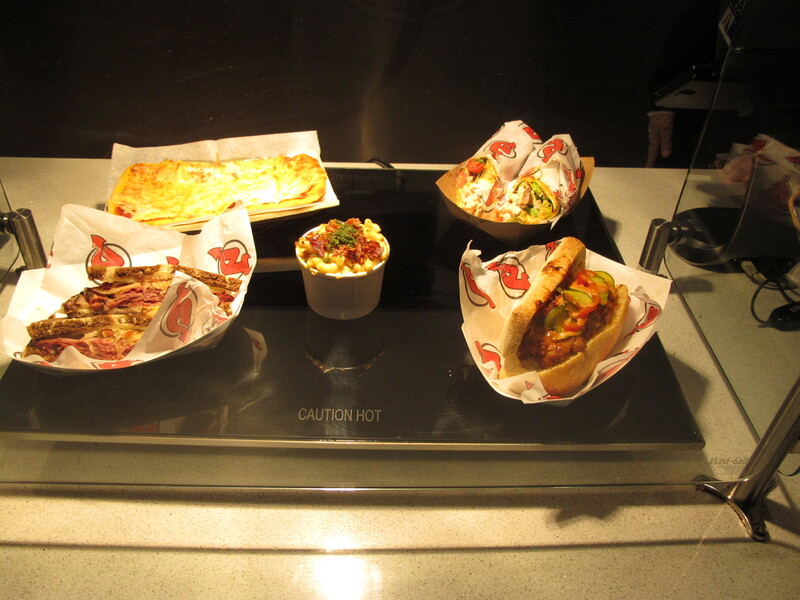 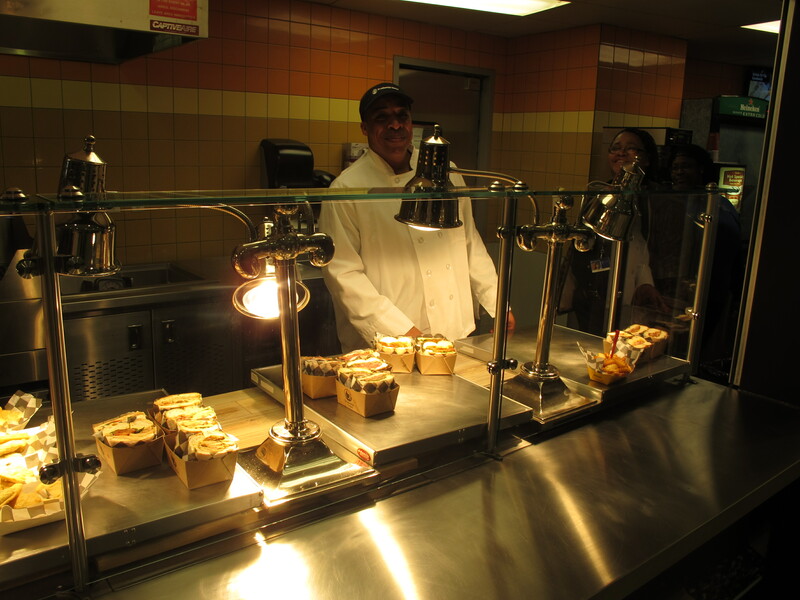 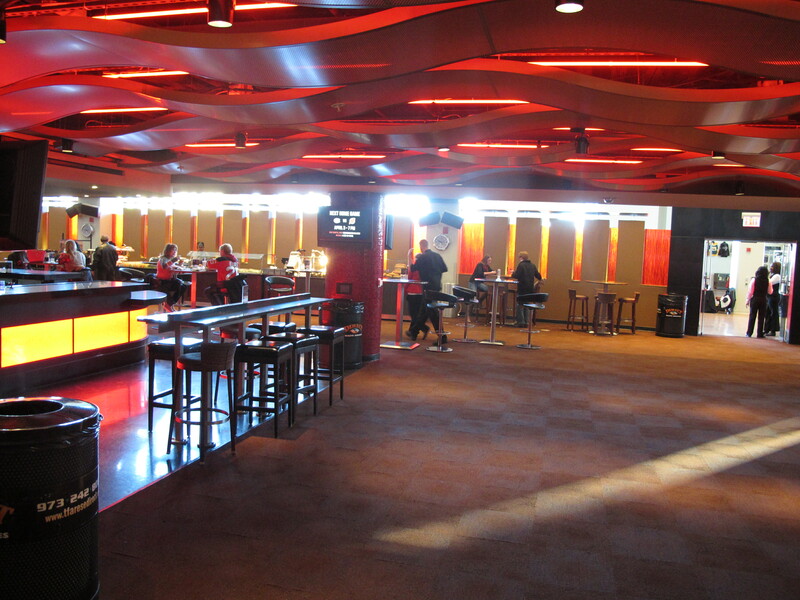 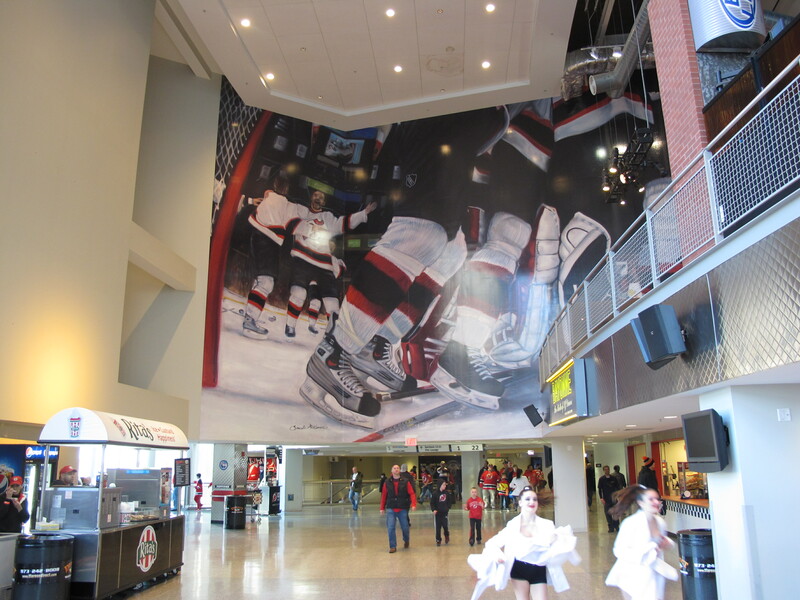 There is a lot of loftiness to the concourse levels, and food and drink options are endless. 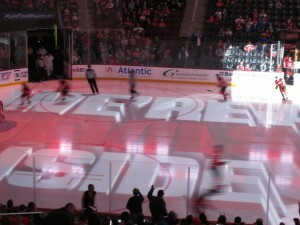 With the game about to start, I watched the countdown to puck-drop, and I was absolutely blown away. 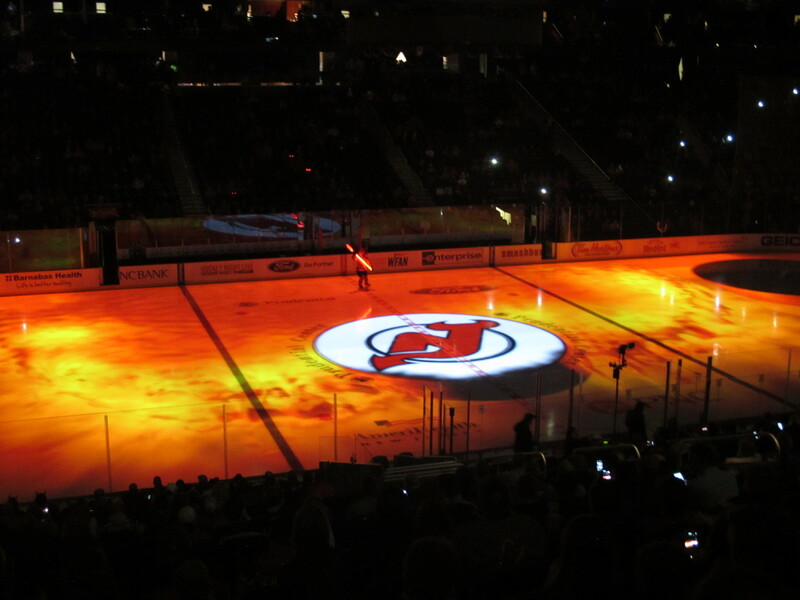 The Devils use 3D graphics on their ice surface (photos do not show how cool this looks), which makes the pre-game show amazing! 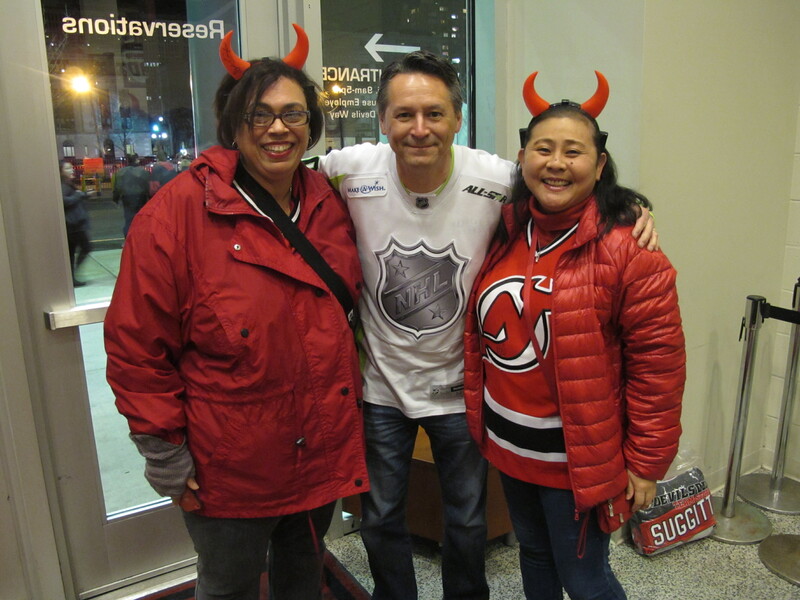 With the anthems played, I had the opportunity to meet their organist (Pete) – it’s neat to see more and more arenas with organists to complement the variety of other music played at games. 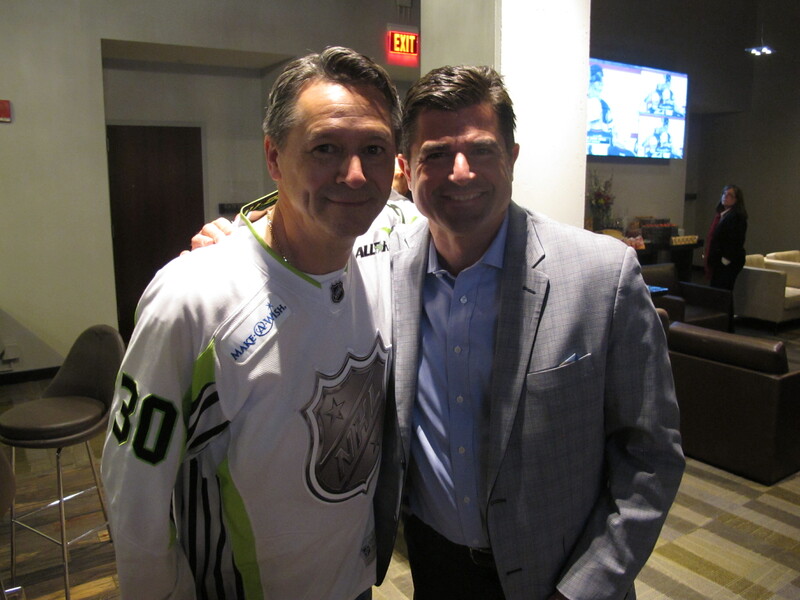 I always enjoy talking to hockey fans, and to continue my tradition of quizzing a local fan on hockey trivia, I met up with Adam, who is the second person in my trip to score a perfect 10 out of 10! Nice guy too! 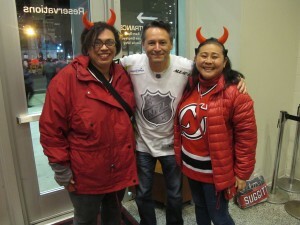 I also met up with a couple of “gals” who saw me at the Carolina Hurricanes game the night before (the Devils were the visiting team), so we took a few pictures. 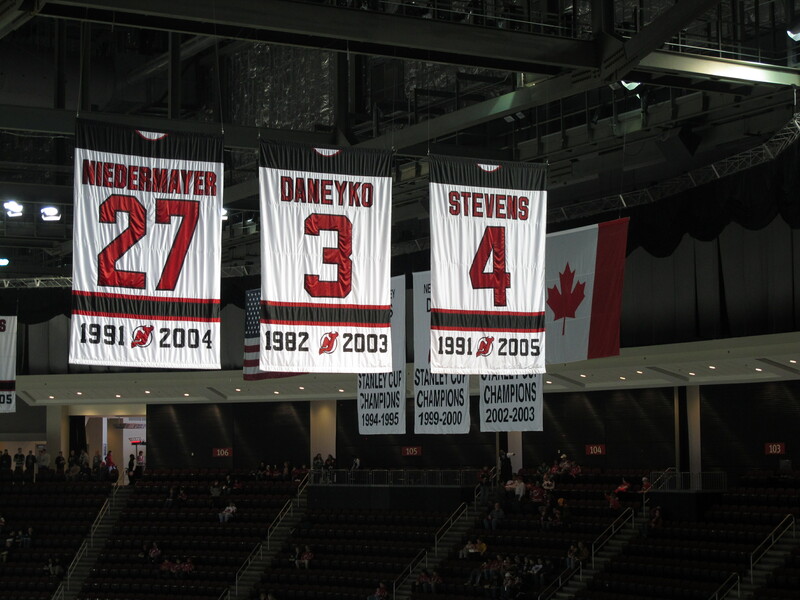 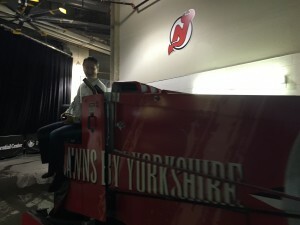 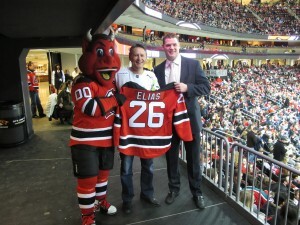 The Devils presented me with two jerseys at the game, one when I arrived (with my name on the back), and the other which was presented at the first break in the second period. 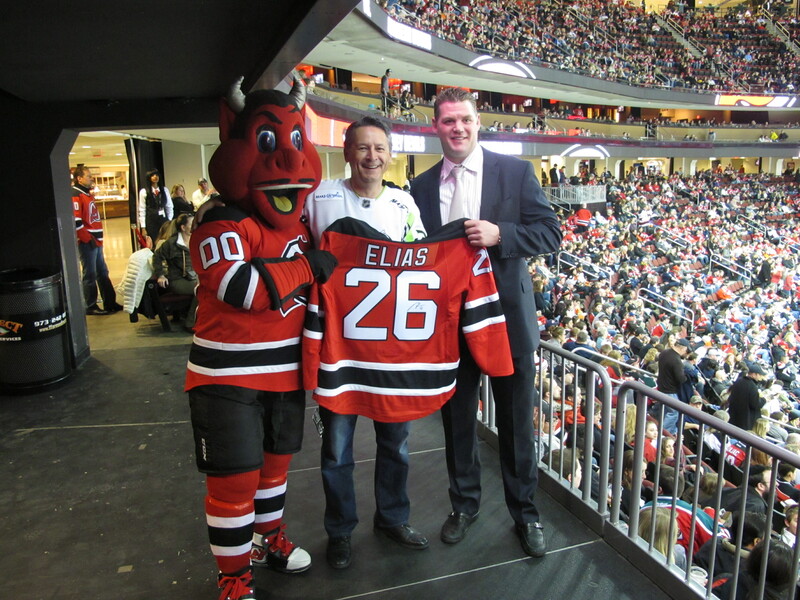 Former Devils player Colin White, and the team mascot (N.J. Devil) presented me with a signed Patrick Elias jersey. 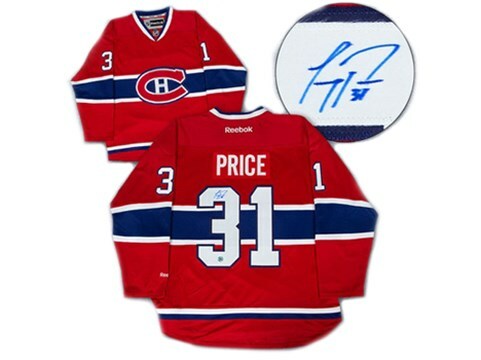 As much as I appreciate and covet a signed player’s jersey, I will be donating this jersey to be auctioned off, with proceeds going to Make-A-Wish. 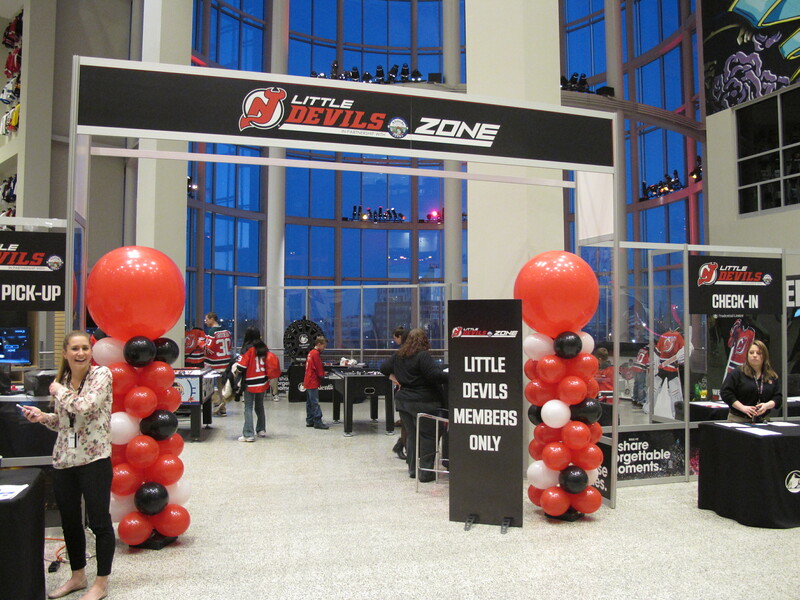 I’m sure the New Jersey Devils will understand. And speaking of Make-A-Wish, the Devils donated a portion of the 50/50 proceeds from tonight’s game to Make-A-Wish, so we can add $3,354.00 to our growing donation total! 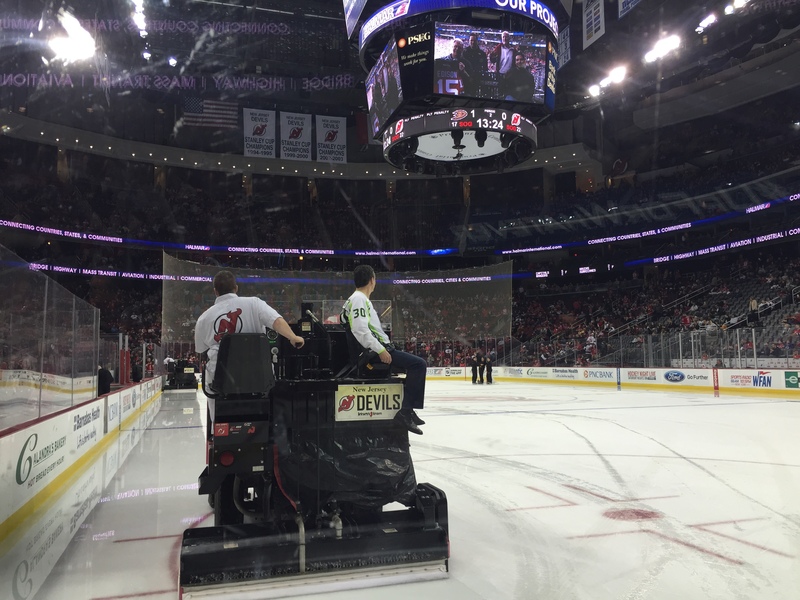 Funny thing – my brother and sister-in-law (who joined me for the game in Chicago two nights ago), asked me if I would ever want to do a Zamboni ride-along, and I said probably not – it’s more for kids. 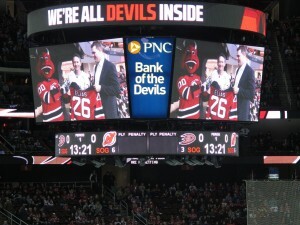 Well – I was asked at tonight’s game, and I must be a kid at heart, because I absolutely loved it! 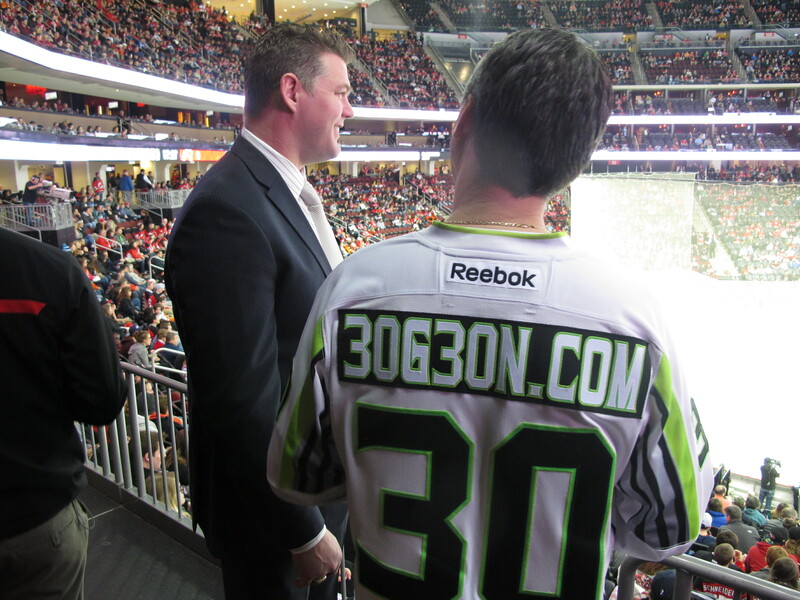 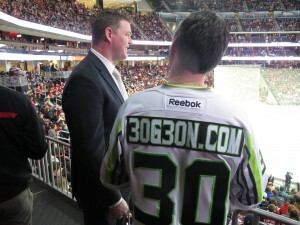 I did a few interviews at the game, including this one with Devils play-by-play announcer Matt Laughlin. 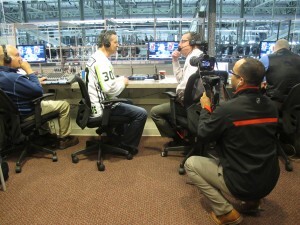 Great to see (and hear) him call the game for a few minutes before the interview. 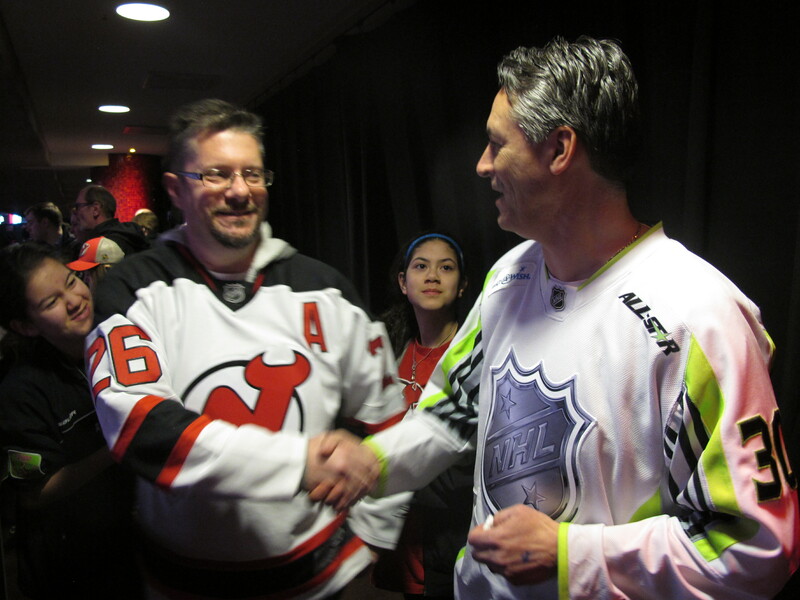 In wrapping up the night, I was introduced to Scott O’Neil, who is the CEO for the New Jersey Devils, the Philadelphia 76ers, and the Prudential Center. Nice to chat with an accomplished man in sport and business – he really got a kick out of my 30games-30nights trip. 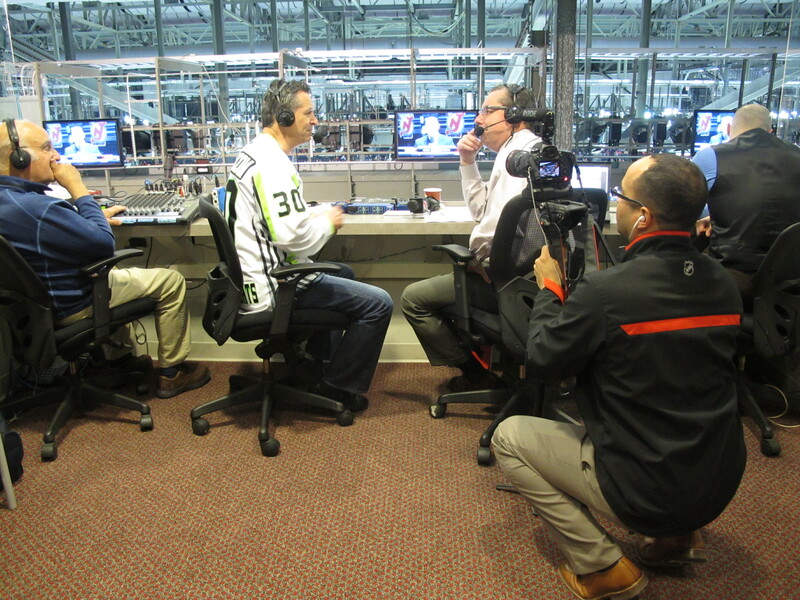 Last but not least, I would like to thank Brian Fisher for taking me around the rink, snapping photos, and just being a terrific overall host. Putting all the special treatment aside, I can objectively say that the Prudential Center is one of the most impressive (if not the best) arena facilities I’ve been in so far this trip! 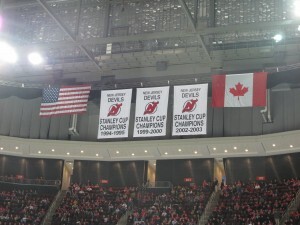 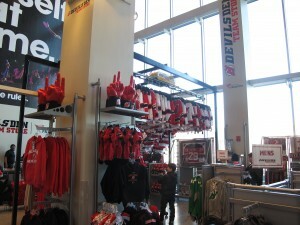 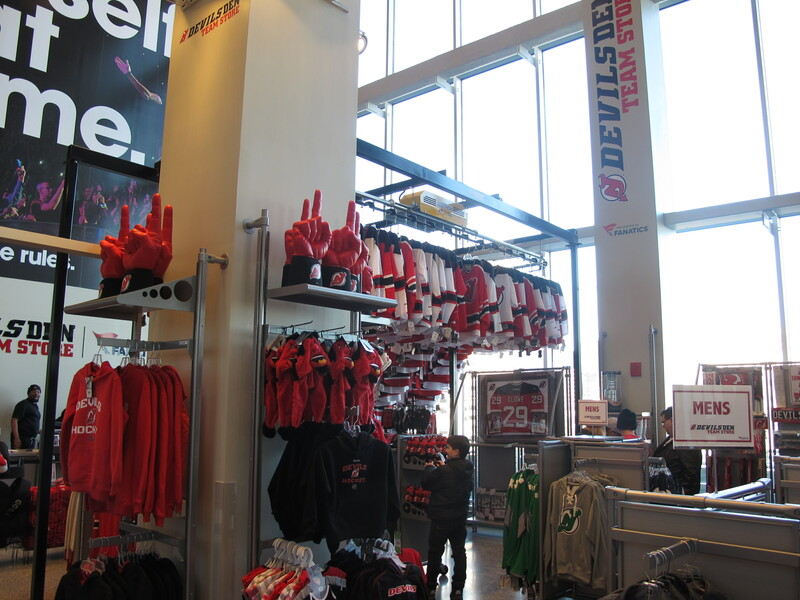 Devils fans (and concert fans, etc.) 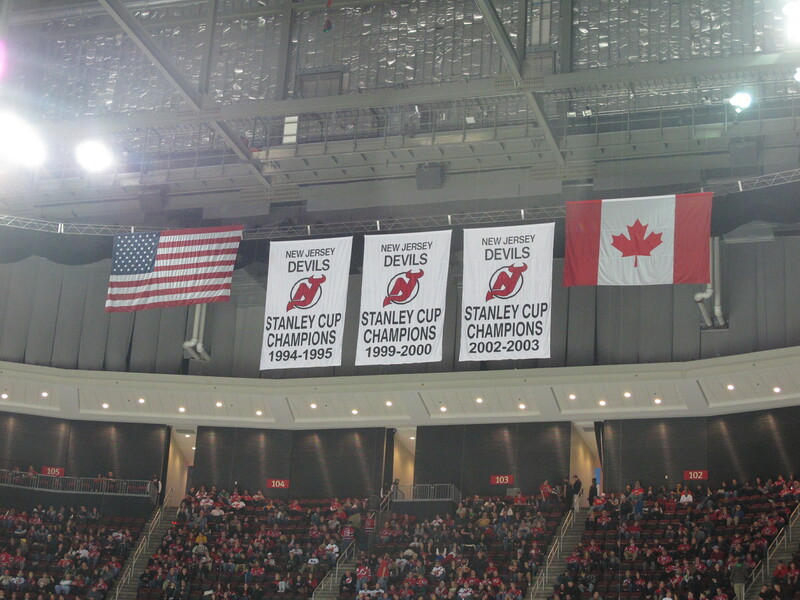 have something special in their city!